Fast fashion promotes the idea that the use value of an item is no more than seasonal at best, further depleting limited resources. For Uniform of Consequence, Jade Spokes transforms single-use and discarded by-products of the consumer market, into ‘camouflage’ high-end couture fashion pieces to critique the interwoven networks of waste and denial that drive the industry. Dressing live models to mingle with opening visitors, an activated showing and installation in the hallway of the Nicholas Building disrupts the conventions of catwalk and exhibition space. Jade Spokes is best known for her sculptural high-end wearable art pieces made from discarded and repurposed materials. Working with the waste of consumerism and transforming the debris into items of high-end couture pieces that explore the boundaries of an items use value. Spokes redefines the boundaries between art and fashion by disrupting the white cube wherever possible. She does this though activated showings of her work, dressing models in an open and unbound way that makes the viewer question their own position as a spectator. 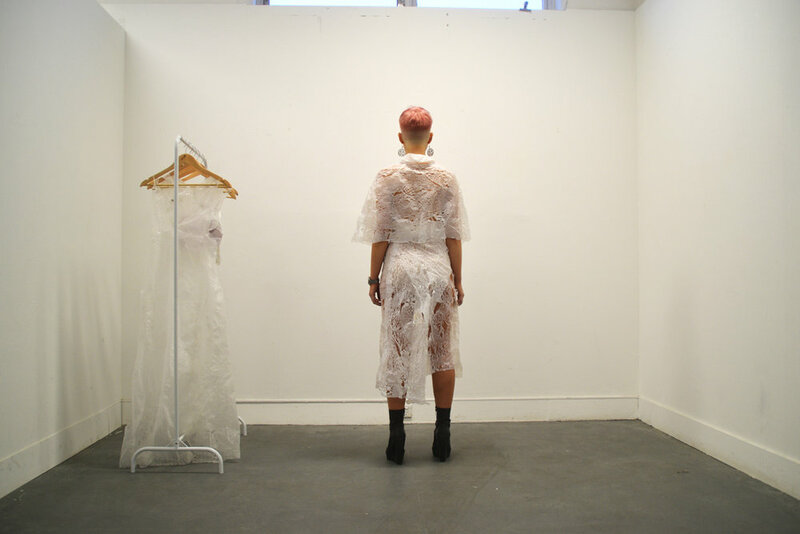 Working closely with Bridie Lunney during her Bachelor of Fine Arts degree at Monash University, Jade Spokes developed an elegant and sophisticated attention to detail in her exploration of the significance of the body within her work. Her work has been highlighted by Monash Lens in an article regarding sustainable practice. IMAGES | JADE SPOKES Jemima, 2018, Repurposed plastic bags, release clips, zipper. | Ella in Tequila Detail, 2018, Repurposed plastic bags, press studs. | Jooyoung Detail, 2018, Repurposed plastic bags, PVC. | Courtesy the artist.